Moxy, the current but unconfirmed name for a start-up U.S. airline, signed a firm order with Airbus to purchase 60 A220-300 aircraft. Moxy is a new aviation venture led by David Neeleman, who founded JetBlue Airways in 2000. JetBlue has also confirmed an order for 60 A220-300 aircraft. Both deals were previously announced, but not completed until the last week of December. Neeleman also founded Azul Brazilian Airlines and is the controlling investor in TAP Air Portugal, the latter of which took delivery of the first Airbus A330-900 back in November 2018. Plans for Moxy, a low-cost airline, were first reported back in June 2018 and then publicly outlined at the Farnborough International Air Show in July. Airbus will produce the A220-300s for Moxy at a new U.S. assembly facility in Mobile, Alabama. Construction of that plant, to be located adjacent to the existing Airbus A320 assembly facility, will begin later this month. Airbus explains the single-aisle A220 is the only aircraft purposely built for the 100- to 150-seat market. The A220 leverages Pratt & Whitney’s new-generation PW1500G geared turbofan engines to offer what Airbus describes as at least 20 per cent lower fuel burn per seat compared to previous generation aircraft. The aircraft holds a range of up to 3,200 nm (5,020 km). JetBlue Airways in late December also firmed up an order for 60 A220-300 aircraft. “As we approach our 20th anniversary, the impressive range and economics of the highly efficient A220, combined with the outstanding performance of our existing fleet of Airbus A321 and restyled A320 aircraft, will help ensure we deliver the best onboard experience to customers and meet our long-term financial targets as we continue disciplined growth into the future,” said Robin Hayes, CEO, JetBlue. JetBlue’s existing Airbus fleet includes 193 A320 and A321ceo aircraft in operation, with an additional 85 A321neo aircraft on order. Airbus will also produce these A220-300 aircraft at its Mobile facility. 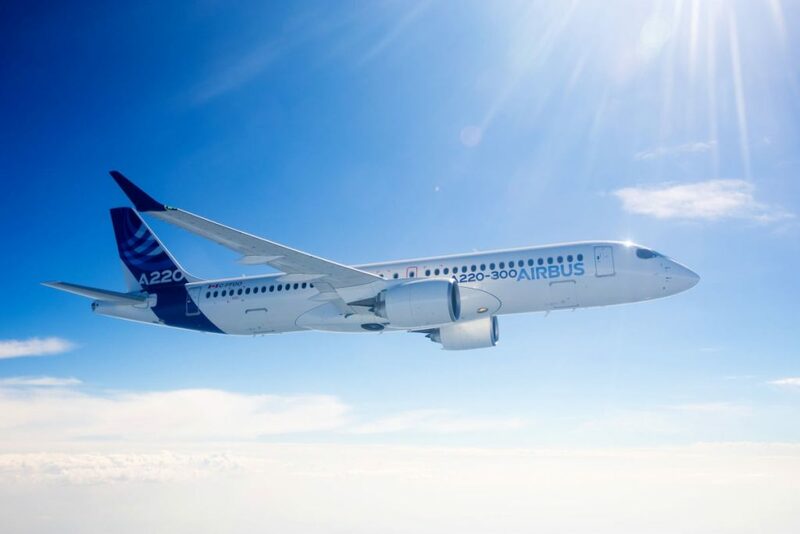 With an order book of more than 500 aircraft to date, Airbus explains the A220 holds the credentials to win the lion’s share of the 100- to 150-seat aircraft market estimated to represent at least 7,000 aircraft over the next 20 years.